Despite carbs being my nemesis, I am a bread lover through and through. I recall as child wanting my ‘last meal’ to be bread and water. I know. These days it would be bread and wine. How very Eucharistic of me. Anyway, I was making some homemade beefburgers the other day and thought why not go whole hog and make the buns as well? Now, I like a crusty roll rather than what is termed a ‘bap’ (I still snigger, can’t help myself). 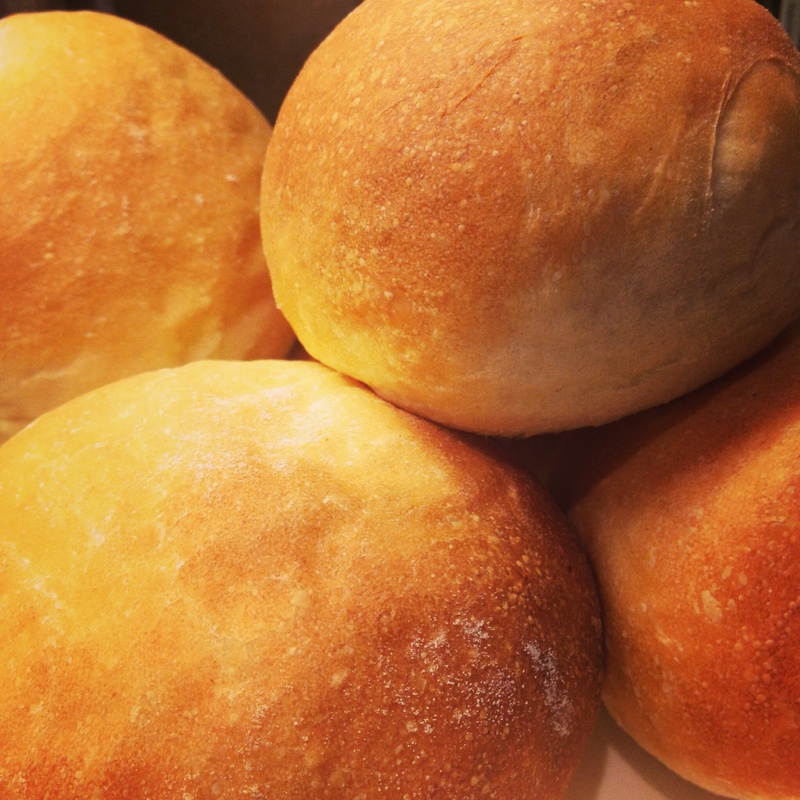 So I turned to the bread guru Sir Paul of Hollywood and made some of his rolls. I altered the salt content slightly (don’t tell him!) but they were really good. With burgers, with soup or just on their own slathered with butter and marmite. Put the flour, salt and yeast in a mixer bowl (take care to separate yeast and salt). Add the butter and 240ml of the water and mix slowly using the dough hook. Trickle in the remaining water and continue mixing for 5 minutes. Put the dough in an oiled bowl, cover with cling film and leave to rise for about 2 hours. Turn out the dough on to a floured surface and knead lightly until all the air is knocked out. Divide the dough into about 12 lumps and shape each piece into a ball. I do this by sort of turning the dough inside out and shaping my hand around the outside. This probably makes no sense, but as long as it is a smooth ball you’ll be ok. Pop the rolls onto a lined baking tray and cover with a large plastic bag for about an hour until they have proved again. Heat the oven to 220C (200 fan) and pop a roasting tray in the bottom. When proved, fill the roasting tray with hot water and pop the rolls in the oven. The steam from the tray gives them a nice crust. Bake for about 15 mins until they are golden on top. Tap the bottoms and if they sound hollow, they’re done. Hi Sarah, What a brilliant recipe. I made these today and thought they were fantastic. I’ll also think about reducing the salt next time I think.